There’s apparently a steep price for upsetting Google, said Kenneth Vogel in The New York Times. The New America Foundation, an influential center-left think tank in Washington, D.C., recently pushed out one of its most high-profile scholars shortly after he critiqued the technology giant, which is one of the foundation’s biggest donors. Barry Lynn was the leader of New America’s Open Markets initiative, and for years he “has led a growing chorus of liberal criticism” of the monopolistic practices of tech giants like Google, Amazon, and Facebook. 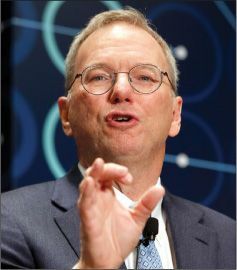 In late June, Google chairman Eric Schmidt reached out to the foundation’s head to say he was displeased that Lynn had publicly lauded European antitrust regulators for fining Google a record $2.7 billion. A few days later, New America, which has received some $21 million from Google and Schmidt since 1999, told Lynn that it would be cutting ties with the Open Markets team. It has since fervently denied that pressure from Google had anything to do with the decision.